With the help of magnetic paint you can turn any wall into a magnetic wall. For individual wall decoration, paint any surface two to three times with magnetic paint. Thereafter, you can paint over it with any colour and thereby integrate the magnetic area with the rest of the wall. Now you can attach pictures, photos and other objects with magnets. If you want to write on the wall, we recommend using whiteboard or chalkboard paint, with which you can also paint over magnetic paint. 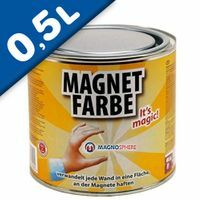 Magnetic Paint / Magnetic receptive wall paint - 500 ml Tin attracts magnets! Magnetic Paint / Magnetic receptive wall paint - 1000 ml Tin attracts magnets! Magnetic Paint / Magnetic receptive wall paint - 2500 ml Tin attracts magnets! Magnetic Paint / Magnetic receptive wall paint - 5000 ml Tin attracts magnets! Using our magnetic paint is easy and the innovative solution to transform the walls of your home or office into a fun, creative magnetic receptive surface. Combine the highest quality magnetic paint with our award-winning whiteboard paint to get a surface that is both writable and magnetic. Use in offices, classrooms, corridors, communal areas, across entire floors and buildings. Discover how magnetic writable surfaces can be used to transform the way you plan, brainstorm, teach and learn. On magnetic paint, magnets develop only a fraction of their maximum adhesive force. Therefore, use large enough neodymium magnets, especially cubes and discs. Magnets in steel pots and ferrite magnets are not suitable for magnetic paint. The right magnets and realistic expectations regarding adhesive force can make a wall painted with magnetic paint a fun and practical space. Who supplies high quality Magnetic Paint? Magnosphere offers best priced Magnetic Paint globally to all industries, including Automotive, Aerospace, Military, Advertising, Design House, Electronic and Academic/R&D. Please inquire for custom Neodymium magnets or magnetic assembly. 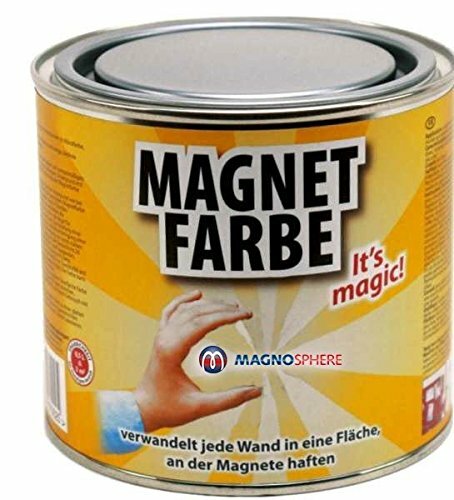 Buy Magnetic Paint at Magnosphere and get a better deal!